The car is registered here in Georgia, and I have a clear title in hand. – Suspension is tight, car still handles admirably. Alignment is good, great cornering. – Mechanically sound if not perfect – I would feel comfortable driving it on a 500 mile trip. – Paint is still in serviceable condition, but would need to be painted to be perfect. – Sunroof works and removes easily to store in trunk. – Stock radio/cassette is working. – Dash is not cracked and in good shape, other than residue from dash cover adhesive. – A/C is cold, heat is hot. – Passenger side power window works. Instrument cluster lights up, gauges above shifter function. – Original Audi floor mats look aged, but have really stood the test of time. – Fun to Drive, Everybody smiles when they see it. – Exhaust manifold has a crack and needs to be replaced or welded. The good news: once the engine heats up, you can no longer hear it. – Driver’s side window does not go down: the driver’s side door is missing the entire power window hardware. (Something that was not disclosed when I bought it.) Will need to be sourced and replaced for window to function. – Missing front lower grill inserts. 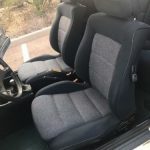 – Missing interior trim: door lock actuator cover, outside cap for driver and passenger seats, plastic cover over passenger side mirror, driver and passenger side map pockets. – Ash tray lid is broken. 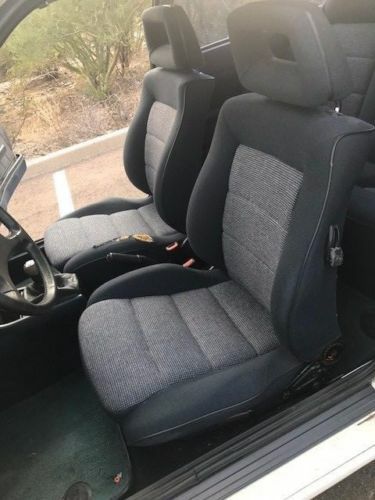 – Fabric of passenger seat bolster and center of rear seat bottom cushion torn. – Passenger side seat won’t tilt forward to let in rear passenger. – There is light denting and scraping around the bumper line of the car… looks like it was parked in a grocery parking lot regularly. – Clutch pedal is a little squishy, but functions fine with no slipping. My mechanic did not think it needed service in August. 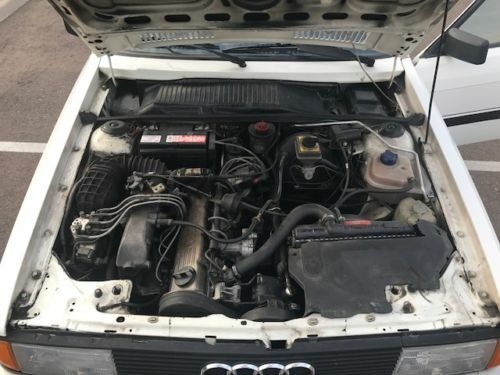 Overall, considering this is an Audi from over 30 years ago, it’s very solid. Many of the missing parts are purely cosmetic, and only matter if you are wanting to restore this Coupe GT to its original condition like I did. 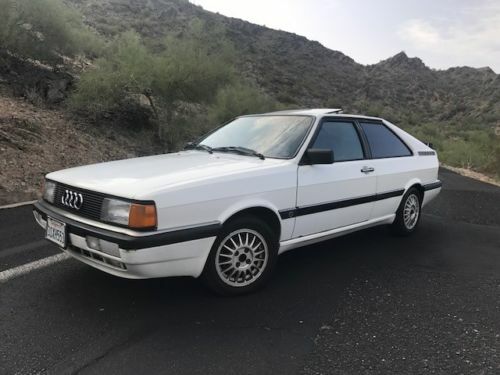 The reserve is set very low because I need the space in the garage… To the right person, someone searching for an original post facelift (1985+) coupe GT with a manual transmission, this is the bargain of the century. This Audi runs and drives good. Fun to drive. Has A/C. The clock still ticks. I take it to the local cars and coffee every month and get a lot of people who are in awe because they haven’t seen one in ages. The body is straight. Rust free. All the moldings, trim pieces, lights etc are all in great shape. Wing is in great shape. Removable moonroof. The interior is super clean except for the passenger seat which has a small rip. Comes with Official Audi Factory Repair Manual for the 4000, 4000cs and GT Coupe model. Original owners manual. Comes with bag full of misc. tools etc. Has minor scuff marks as seen in picture below. Passenger side has paint missing due to scuff. Has the common odometer issue. Stopped working. Alpine White is a great shade on these cars, and suits the design well. It’s not as often seen as Tornado Red or Zermatt Silver, but certainly more frequent than Oceanic or Copenhagen blues. Inside the car has the ’85 model year sport cloth, an option that would disappear for the ’86 model year. 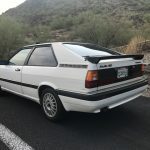 The only other ways to note the difference between ’85 and ’86 models was that, generally speaking, most of the ’85s lacked the full cover on the Ronal wheels (with a black octagonal nut in the center bore instead), they lacked the mandatory ’86 up third brake light and ’85s continued to pronounce that they were fuel injected with a badge on the right side of the trunk lid. This disappeared too for the ’86 model year. Generally speaking, this example looks to be a solid driver candidate. 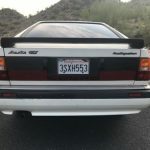 There’s little information offered about the history or current mechanical state, but the car shows as better than most at this point of its life. The seller loses a few points by referring to the scuffs as “minor”; those were fairly substantial misjudgements of how wide the car was. In looking at those photos, it should be noted that the car is lacking the rear plastic stone guards on the leading edge of the fenders on both sides; there’s the potential for a respray evident. 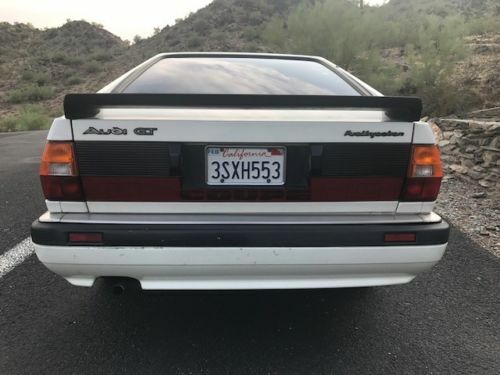 Also, the seller mentions that all the trim pieces are in great shape, but obviously neglects that a few are missing; the lower grills being the most evident, but there’s plenty of other cracked and missing items; the rear trunk release knob, the shattered shift knob pattern, half a missing map pocket on the driver’s door, the passenger side reflector lens. The seats are a bit tired too, and oddly it’s not the driver’s one that has taken the brunt of age; instead, both the passenger and rear seats show rips, odd for one of these cars, but the sport cloth didn’t hold up as well as the Kensington Velour that was standard in ’86. 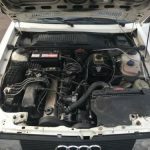 The seller also lists the mileage in the headline of the car’s features, but then discloses later that it has suffered typical odometer failure. However, as a Type 85 aficionado, I’d estimate it doesn’t have a tremendous amount more than that – though all those miles haven’t always been the most kind. Though the exterior looks decent, under the hood and in the jambs is quite dirty and a simple cleaning could do wonders. A West Coast car, it appears rust-free and overall still quite presentable in spite of the issues. The price is fairly aggressive in light of the problems, though. 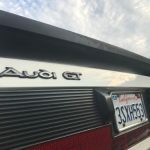 Without knowledge of exactly what the mileage is or the mechanical state of everything, you’d be unwise to pay top dollar for a GT – and this is top dollar. 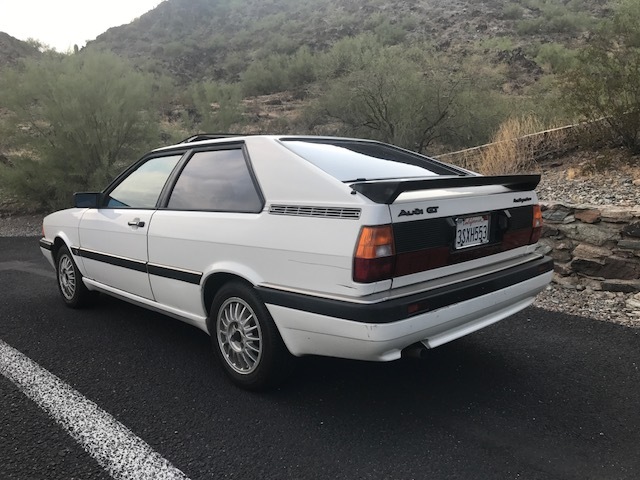 The ’85 model doesn’t have anything particularly special about it and this one isn’t unique in either it’s specification nor its condition. 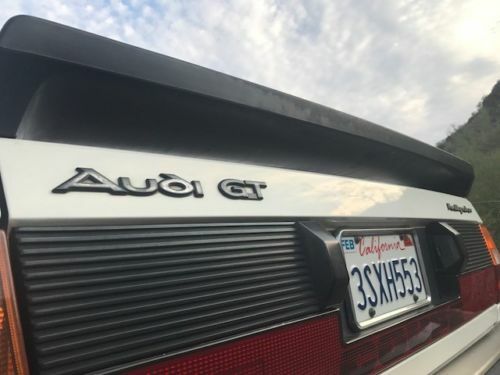 For this money, I’d hold out for a more special and quicker 87.5 Special Build GT; better interior, paint trim, 4-wheel discs and collectability (plus, an electronic dash!) await you. To me, this car represents a realistic market value of $2,500 – $3,000 at most, so it’s unlikely to change hands anytime soon. 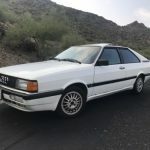 Tagged 1985, Alpine White, Audi, B2, Coupe GT, inline-5, KX, Ronal, Sport Cloth, Type 85. One of these days, I am going to do something silly and buy another CGT and put a lot of money making it a trailer queen. Each time I see one, I still get excited.